Market Monetarists have long made the case that a nominal GDP (NGDP) level target would firmly anchor the expected growth path of nominal income. Doing so, in turn, would stabilize current nominal spending since households and firms are forward looking in their decision making. For example, holding wealth constant, households generally will put off purchasing a new car or renovating their homes if they expect their nominal incomes to fall and vice versa. This is why Scott Sumner likes to say monetary policy works with long and variable leads. This understanding implies, therefore, that the reason for nominal spending remaining below is its pre-crisis trend is that the Fed has failed to restore expected nominal income to its pre-crisis path. This failure amounts to a passive tightening of monetary policy. In the past I provided some supporting evidence for this view using data from the Survey of Professional Forecasters. Thanks to Evan Soltas, we now know of an another measure of expected nominal income growth that provides further evidence for the Market Monetarist view. The data comes from a question on the Thompson Reuters/University of Michigan Surveys of Consumer where households are asked how mcuh their nominal family income is expected to change over the next 12 months. The figure below shows this measure up through October, 2011. This figure shows that for most of the Great Moderation the Fed kept consumer nominal income expectations anchored around 5%. That is a remarkable accomplishment. But the figure also screams massive Fed failure. It shows a decline in expected nominal income growth that gradually begins in late 2005 and sharply accelerates in 2008. This fall is unprecedented in the series. 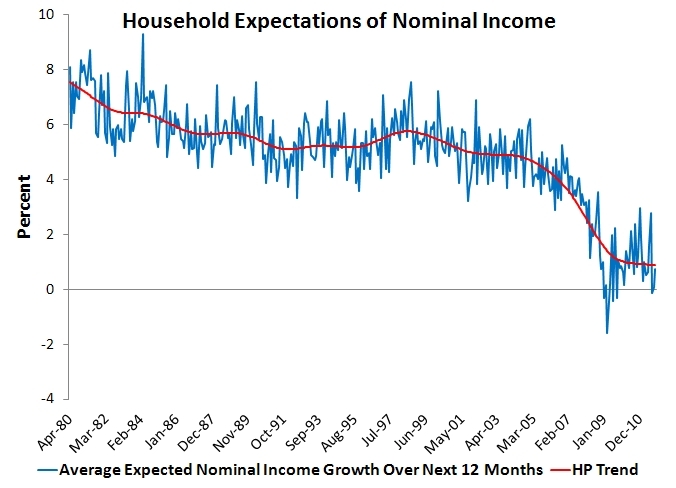 What is even more troubling, though, is that expected nominal income growth has remained flat. 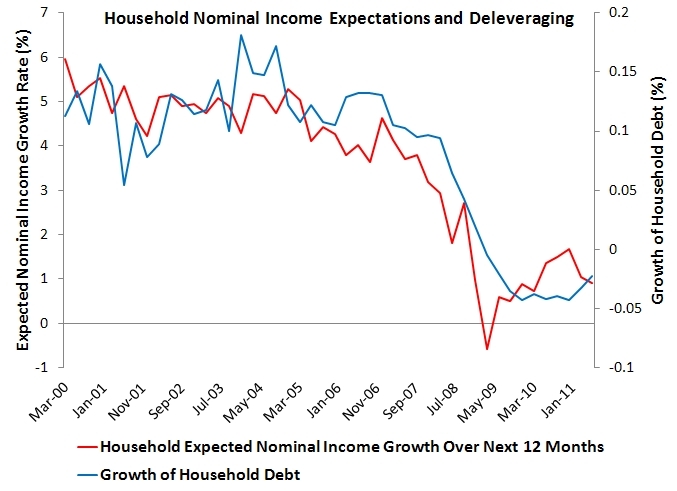 The Fed has failed to restore expected nominal income growth back to normal levels. It should be no surprise, then, that households are deleveraging and holding an inordinate amount of liquidity in their portfolios. 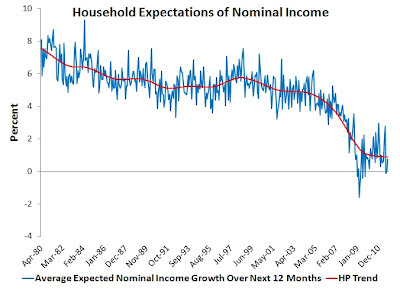 A recent study that makes use of this data has findings that reinforce the importance of stabilizing nominal income expectations. Mariacristina De Nardi, Eric French, and David Benson of the Chicago Fed in paper titled "Consumption and the Great Recession" examine the importance of changes in expected nominal income and wealth for aggregate consumption. Among other things, they find that expected nominal income growth deteriorates across all age groups, educational levels, and income levels over the past few years. This is not some sectoral-specific (i.e. structural) development. They also find that the collapse in expected nominal income growth was an important determinant of the fall in aggregate consumption during the Great Recession. This new data, the Chicago Fed study, and my previous post all indicate how important it is for the Fed to properly manage nominal income expectations. By this criteria there has been a dereliction of duty by the Fed. It is time for the Fed to recognize its failures and adopt an approach that better anchors nominal income expectations. It is time for the Fed to adopt a NGDP level target. P.S. Maybe the Chicago Fed study had some influence in converting Chicago Fed President Charles Evans to a fan of NGDP level targeting. David - It´s becoming "popular" to mention NGDPLT, and more and more frequently we hear of new people jumping in the bandwagon! Altig seemed unable to see NGDP targeting as an alternative regime. It is all, "is there an output gap now?" Altig: #sigh# he seems deeply impressed by a new survey which purportedly shows inflation expectations are skewed to the upside (wish it were true, i saw the data- tenuous). i wrote a looooong rebuttal comment i wonder if he'll post it. excellent expectations chart & paper! i sure hope theres an economy to apply this to by june! if rumors of Spanish bank runs dont force a response... well it ends badly. Altig posted my somewhat rant-ish fed bashing comment under his post on macroblog. even better, WSJ linked to Altig so more eyeballs on the debate. yea team ngdp. Good work dwb. Let's keep them honest.